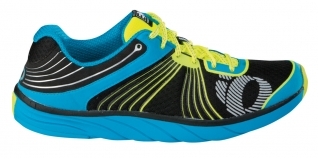 Pearl Izumi have a new project hitting the tri, trail and road shoes beat. To badly paraphrase Nineties British house act Nomad - they want to give you E:Motion. But are they in tune with the demands of 21st century runners? Tempted by the promise of an “ultra-smooth, light-as-a-feather, running experience,” Tim Heming road tested a pair to find out. The first thing to note is I was donning a pair of N1's, Pearl Izumi's lightest shoe and its racing flat for the road. There are three more choices in the road range, the N2, M3 and H3, each with progressively more support (and weight) and an additional three trail and two tri shoes. As you'd expect for a brand synonymous with triathlon, as much weight as possible has been shaved off. It comes in at 232g (Size 8 UK), so although there appears a relatively thick foam wedge under foot, the seamless upper is minimal with no support. Its design is typically tri, in your face to the point that if I hadn't worn such a garish dressing gown they could have looked out of place. Tapping out a steady rhythm over the tarmac and light trail in London gave the first warning that the N1's weren't going to be overly forgiving. The effective 3.5mm heel to toe drop felt too fierce for my natural heel striking gait and didn't seem to be aiding me with enough spring when I tried to quicken my stride and transfer more to the forefoot. The N1s big test came circumnavigating 26.2 lumpy miles around Cumbria's best known body of water. Given camping was on the agenda, and having run this event previously and suffered vomiting through heat and unfamiliar nutrition (Kendal Mint Cake is now avoided), I was in no mood, or physical shape, to risk a repeat. Setting off conservatively, concentrating on an efficient turnover and good form, the shoes really delivered. An opportunistic hilly 13.1miles in the pretty Cotswold village provided the final test for the N1s. Again out of form and running fitness (a constant theme), the steep first mile left me sapped and well off the pace. Recovering on the flat sections, the N1s felt like an old friend, tapping out a rhythm to catch people in the latter stages. Pearl Izumi want to transition from the small lake of triathlon and hope Project E:Motion will keep their heads above water in the the big sea of social running. It's still a brand that will appeal to triathletes, and although they have not necessarily made the jump to the running masses with this product, remember it was the high-end N1 on test, not engineered to appeal to many first-timers. For shorter distances you could probably find something lighter and faster, but for a trail marathon, flat marathon for a decent standard club runner, or slipping them on after a hard swim and bike for an Ironman marathon, they can be relied on for a comfortable ride. The literal Japanese translation of Pearl Izumi is ‘fountain of pearls.' As long as you don't pound out all your training miles in them, you might have stumbled across a gem with this one. See http://projectemotion.pearlizumi.com for more information.